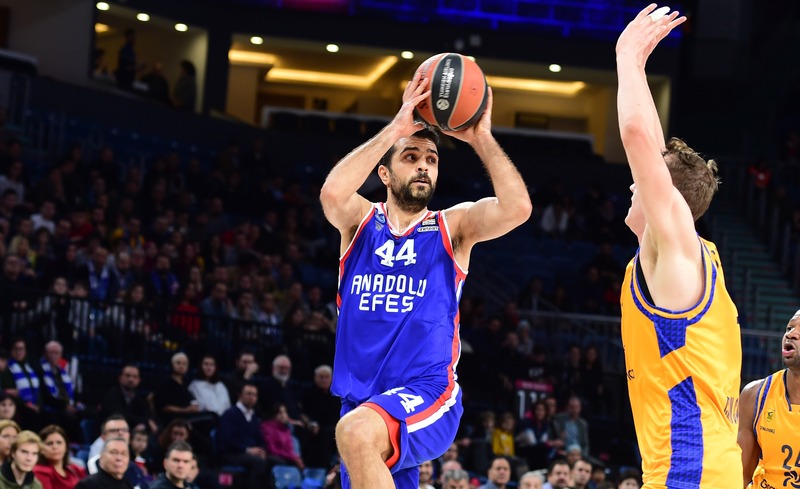 A stellar performance by Krunoslav Simon paced Anadolu Efes Istanbul to an important victory that kept his team one step ahead of the opposition in the race for the fourth place in the standings, and in the process saw Simon earn MVP of Round 22 honors. Simon powered Efes to a 93-74 home win over Herbalife Gran Canaria, accumulating a performance index rating of 34, the second best of his seven EuroLeague seasons and the highest of any player this round. Simon set a new career-high by scoring 25 points, making 5 three-pointers on only one miss. He had a near-perfect shooting night, also making 3-of-3 two-point shots and 4-of-4 free throws, while also posting 4 rebounds, 3 assists, 2 steals and 5 drawn fouls. This is Simon’s second MVP of the Round honor, five years after his first. Two players accumulated a PIR of 28, the second highest of this round: Khimki Moscow Region big man Jordan Mickey and AX Armani Exchange Olimpia Milan forward Mindaugas Kuzminskas. In an important 90-98 road win victory over Buducnost Voli Podgorica, Mickey starred with 25 points, 4 rebounds, 1 assist and 1 steal. Kuzminskas bagged 19 points plus 8 rebounds in a 90-78 win over Darussafaka Tekfen Istanbul. Nicolo Melli of Fenerbahce Beko Istanbul claimed the next best index rating, 27, in an 85-66 win over Panathinaikos OPAP Athens which clinched Fenerbahce’s playoffs berth. Melli collected 14 points, 7 rebounds, 4 assists and 2 steals. Rounding out the list of top performers is a pair of Buducnost players, center Goga Bitadze and point guard Norris Cole, who each had PIRs of 25 in a loss against Khimki. Bitadze posted 17 points, 7 rebounds and 2 blocks, while Cole had 20 points, a career-high 11 assists and 2 rebounds. Simon and Mickey were this round’s top scorers with 25 points apiece. Milan’s Mike James remains league leader, averaging 20.2 points per game. Vincent Poirier of KIROLBET Baskonia Vitoria-Gasteiz pulled down 11 rebounds to lead all players in Round 22. Olympiacos Piraeus center Nikola Milutinov is league’s top rebounder this season with 8.0 per contest. Cole had 11 assists, the only player in double-digits in that category this week. Panathinaikos point guard Nick Calathes is the league leader, averaging 8.1 assists. In Round 22, four players had 3 steals: Facundo Campazzo of Real Madrid, Luca Vildoza of Baskonia, Toney Douglas of Darussafaka and Sean Kilpatrick of Panathinaikos. Douglas tops the charts this season with 1.9 steals per contest. Alex Tyus of Maccabi FOX Tel Aviv and Ioannis Papapetrou of Panathinaikos led all players with 3 blocks this round. Walter Tavares of Real Madrid is the league leader in blocked shots with 1.9 per game. There were two double-doubles in Round 22: Cole had 20 points and 11 assists, while Poirier finished with 11 points and 11 rebounds.